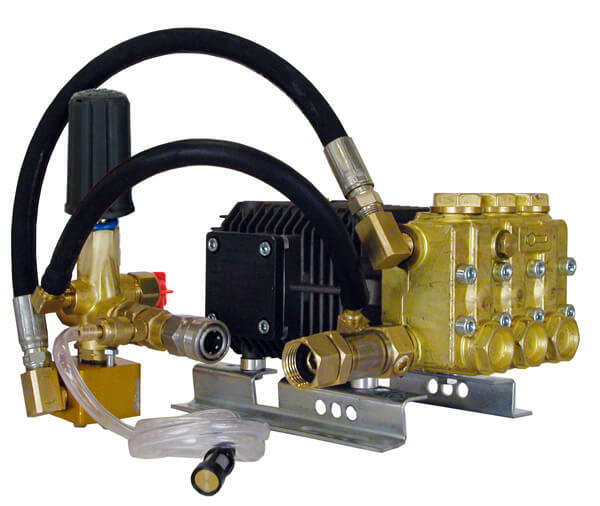 Browse our large variety of industrial rated COMET Pumps for pressure washers and Kits. Built in Italy, most of the models come with a 5-year warranty. 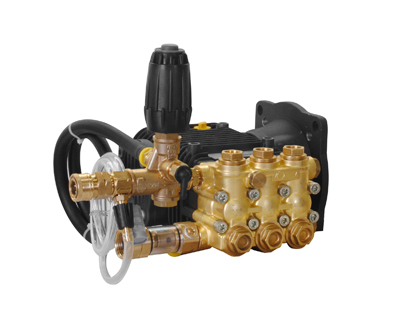 Comet pumps are an excellent replacement pump for most pressure washers and have a fast changeover, even in the field. Most pumps have a reversible crankcase for right or left hand mounting, and are always pre-plumbed and pre-tested. Check more about pump technical information. 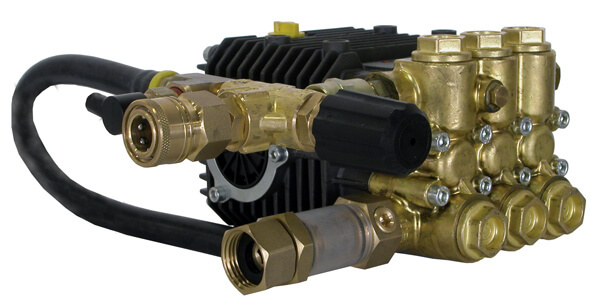 Comet BXD series axial radial pressure washer pumps are standard oem replacement pumps on many brands. Every BXD Series pump comes standard with chemical injectors and stainless steel plungers. These pressure pumps are made direct-drive for gas and electric pressure pumps. BWD Series are commercial grade Comet triplex pump with oil sight glass and oil drain plug. The LWS Series Pressure Pump is made belt-drive for a gas powered motor. With a reversible anodized, die-cast aluminum crankcase, the LWS3025S can be fitted for a left or right hand mounting. These pumps come standard with ceramic plungers and stainless steel check valves and piston guides. Comet ZWD direct drive series pumps are for all heavy duty commercial pressure washing applications. 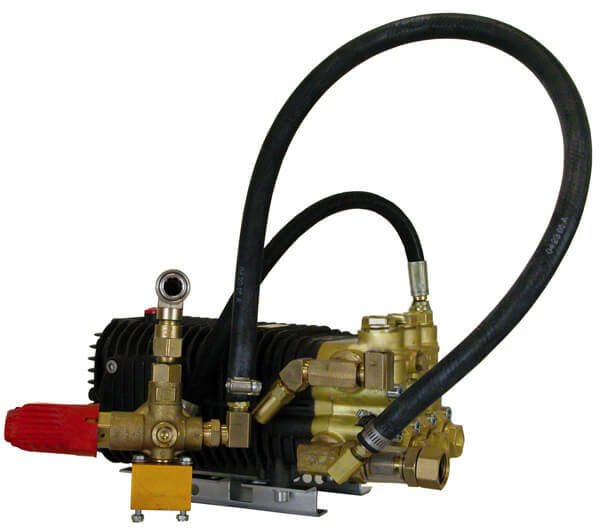 ZWD Direct-Drive pumps couple to all standard one inch gasoline engine shafts. Each ZWD pump comes standard with an enlarged crankcase to increase oil capacity for better lubrication and lower operating temperatures, and is reversible for right or left hand mounting. 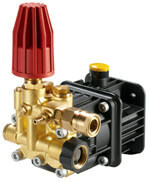 The HW and Series is a standard oem replacement pump for many popular pressure washer brands. The TW Series is made for max stress for all your tough jobs. TW pressure pumps have a 24mm solid shaft for belt-drive, gear box, or flex couplers made for gas powered motors. Each pump has a. The TW Series pump features Die-Cast Aluminum Alloy crankcase that is not only made to protect against rust and corrosion, but is also oversized designed to dissipate heat and improves lubrication for a long life. High quality tapered roller bearings, iodized aluminum crankcase and stainless steel piston guides help build the strength of this "work horse". Every FWS Series pump is equipped with a reversible anodized, die-cast aluminum crankcase that can be used either left or right hand mounted. p>Please use the Comet Repair Chart Below to find the correct parts you need to repair all of your Comet Pressure Pumps. All Comet Pump repair kits contain the total elements necessary to rebuild the entire Comet pump. LW, ZW, FW, and HW Series Pumps consist of hot water seals only, and contain a hot water seal protection. 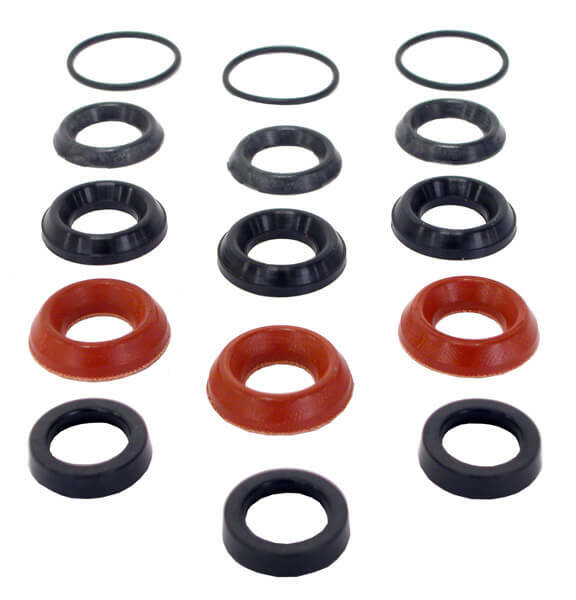 Viton seals are chemically resistant. Pricing is listed below the repair kit chart. 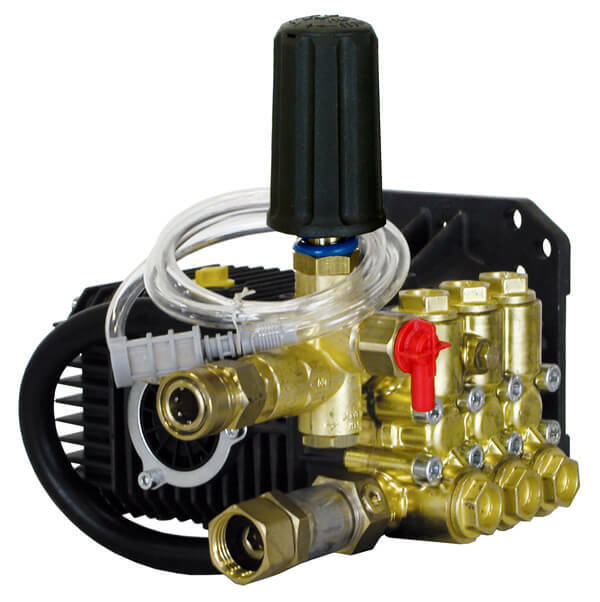 If you are not sure on the part you need for your COMET pressure washer pump, please refer to the COMET pump breakdown diagrams located near each pump. If you still need further support, please send us an e-mail to info@ultimatewasher.com with your COMET pump model number and the part that you need. 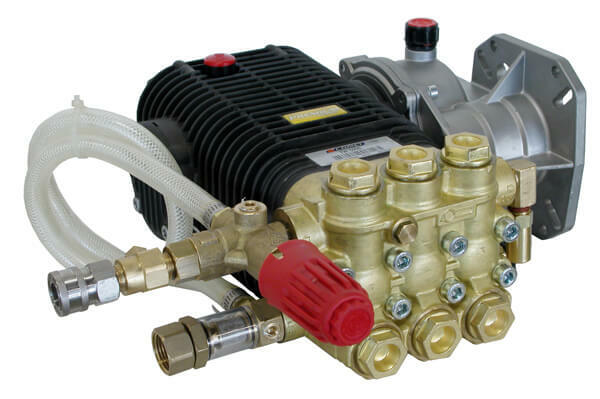 Correct Pump Installation is essential for optimum performance. It is recommended that the pump flow capacity be oversized for the actual flow required. For optimum running of the system the water circulated through the regulating valve should not exceed 10 - 15% of the pump flow. Recirculating too much water can generate heat in the supply tank increasing the cavitation risk. How much should you reduce the pump RPM to achieve a lower flow capacity? What diameter of pulley must I use to achieve the correct pump RPM? What if I cannot change the engine / motor pulley? If the engine / motor is running at a lower RPM than the maximum pump RPM allowed, what will be the pump flow capacity? What is the approximate power required to achieve the max. performances allowed? Conditions to prevent pump cavitation: Minimum difference in height HZ (pos/neg) between pump and water level. The minimum inlet pressure value of the pump is limited by the cavitation phenomenon. Cavitation is the forming of vapor bubble when the local pressure is below the vapor pressure of the liquid. Bubbles flow together with the liquid and when they reach a higher pressure area, they collide, generating abnormal stresses that are extremely dangerous to the pump components. To avoid the risk of cavitation, it is necessary that the pump installation is correct. Car wash ceiling booms and wall booms are available in different sizes and designs that will fit your application. These booms can rotate 360° rotation for the user. You can add wall boom extensions for a bus or truck wash.
Briggs & Stratton make the finest engines worldwide for the brands you have come to trust. Look up here all the features, benefits, specifications, and other info. Change oil every 3-5 months or every 500 hours of operation (initial break-in oil change after first fifty hours). Flush water valves and detergent injectors with plain water on a regular basis after use. Use Line Strainer, 50 mesh minimum. Never store pump with water in it. Consult with us for chemical use.